Twin-wire binding allows book to lie flat when open. Extra-thick backer increases writing stability. Attached page protector flap prevents write-through onto other forms. Includes 50% more forms than standard books. Note: A minimum quantity of 52 must be ordered, and in units of 4 thereafter. 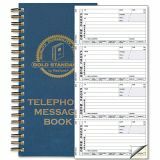 Rediform Wirebound Message Book, 5 x 2 3/4, Two-Part Carbonless, 600 Sets/Book - Gold Standard Phone Message Book features 600 two-part, carbonless phone message forms. Each page has four 5-2/3 x 2-3/4" forms. 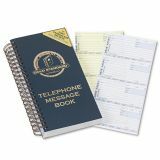 Each form has prompts for message recipient, date, time, caller's information (phone, cell, fax and company, email), and the signature of the message-taker. Prompts at the bottom let you indicate what kind of message with Phoned, Call Back, Returned Call, Wants to See You, Will Call Again, Walk-in and Urgent. 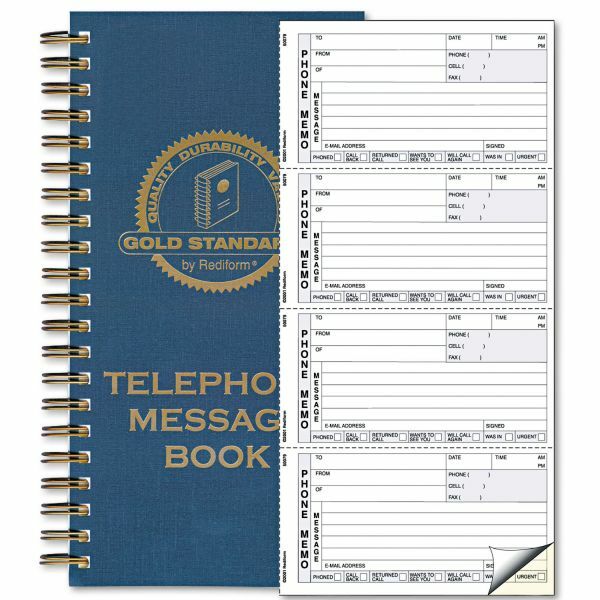 Thick blue linen-look, gold foil-stamped cover with heavy-duty, 80 point coated chip backer for support when making entries in the field. Twin-wire spiral binding means pages lie flat for easy writing."